They’ll provide the best care, but they’d prefer to meet you outside of hospital: physiotherapist Karina Rose, intensive care nurse Nic Brown, Dr Kerry Chen, Dr Stephanie Naim with Dr Hatem Elkady (front) from Westmead ICU. 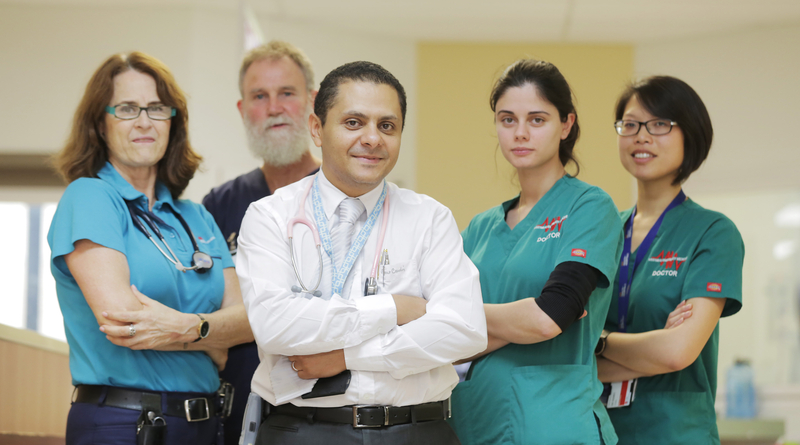 Intensive Care Unit (ICU) fellow Dr Hatem Elkady has urged community members to stay safe over the Easter holiday period and avoid an accident that could require months or even years of rehabilitation. Dr Elkady said a hospital visit to Westmead ICU would not end there, with extensive treatment and rehab to follow. “If you survive a crash with a head injury, you could end up on a life support machine for up to three months,” Dr Elkady said. “You could need up to five major surgeries – and many more procedures, treatments and rehabilitation after that. “We promise to provide you the best possible care, but accidents can have bad outcomes … all the way up to death. NSW Police has urged motorists to avoid driving while tired. Traffic and Highway Patrol Commander Assistant Commissioner Michael Corboy. Photo credit: The Northern Daily Leader.